(Formerly Acorn Bike Ride) May 11, 2019. Ripon Rotary Club is delighted to be organising it’s third Ripon Rotary Bike Ride. The ride is taking place on May 11th 2019. We are so grateful to those who have supported us over the past two years raising c£63k all of which supports many charities. The 100k circular route remains the same and will take you through beautiful North Yorkshire villages along roads and country lanes, you’ll start and finish at Bishop Monkton Village Hall. There are regular water and refreshment stops every c17k with a lunch stop at Sheriff Hutton Village Hall (sandwich, fruit, chocolate and drinks and riders will return to a warm welcome back at Bishop Monkton where you can enjoy our renowned tea and cakes! 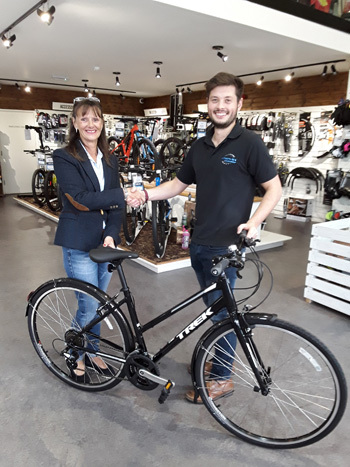 The aim of the bike ride is to continue in raising much needed funds for Dementia Forward, Scleroderma Research and other charities supported by Ripon Rotary Club. With your sponsorship monies you will be providing inspiration and hope to people living with Dementia and Scleroderma, as well as helping to carry out more research, give more people the very best treatment and care – and improve the quality of people’s lives. This is a sponsored charity ride so please ask family and friends to sponsor you generously to make a real difference. THANK YOU. This is NOT a race but a family fun ride (and by signing up for the ride you are declaring you are fit and capable to undertake the ride, your bike will be in a good state of repair and cycle helmets will be worn). Are you up for it? - register now! If you are still unsure if you can participate, then please sign up now for the (occasional) newsletter, to be kept updated! at midnight on Saturday, 04 May 2019. After that you can only register at Bishop Monkton Village Hall from 0700 hrs on the Bike Ride day, at the higher entry fee of £40.00. TELL A FRIEND ABOUT THE BIKE RIDE?